Siddhartha is an allegorical novel by Hermann Hesse which deals with the spiritual journey of an Indian man called Siddhartha during the time of the Buddha. The book, Hesse's ninth novel, was written in German, in a simple, yet powerful and lyrical style. It was first published in 1922, after Hesse had spent some time in India in the 1910s. It was published in the U.S. in 1951 and became influential during the 1960s. The novel takes place in ancient India around the time of the Buddha (6th century BC). It starts as Siddhartha, a Brahmin's son, leaves his home to join the ascetics with his companion Govinda. The two set out in the search of enlightenment. Siddhartha goes through a series of changes and realizations as he attempts to achieve this goal. When Siddhartha, the handsome and popular son of a Brahmin, becomes weary of the formal and strict ways of Hindu prayer and sacrifice, he leaves home together with Govinda, his admiring friend. They join a group of shramanas, wandering monks who live in the woods and try to conquer the Self by disciplining the mind and mortifying the body. After three years of this life, the young men hear about the Buddha and leave the ascetic lifestyle to listen to his teachings. Govinda joins the Buddhist monks, but Siddhartha is convinced that only personal experience and not external teachings can lead to true knowledge and enlightenment. At this point, Siddhartha decides to "find himself" and re-enters the world. Soon Siddhartha comes upon the house of a rich and beautiful courtesan, Kamala, who takes a liking to the young man. She tells him that in order for her to teach him the art of love, he must find a job and return with gifts. Siddhartha becomes assistant to a merchant, Kamaswami, and becomes a successful businessman. He initially remains detached and rather amused about how seriously the "child people" take everyday matters, but gradually he immerses himself in a life of gambling and greed. Eventually, unhappy and tired of playing life like an empty game of distractions, he departs the town forever. Depressed and confused, Siddhartha comes upon a river and prepares to drown himself. Then he hears in the river's murmurring a sound, "Om," which is the Dharmic symbol for the oneness of everything in the universe. Those who truly understand the sound's meaning are enlightened. All suicidal thoughts vanish. After a spiritually as well as physically refreshing sleep, Siddhartha meets for the second time the enlightened ferryman, Vasudeva, and decides to stay with him. The two work together as ferrymen and live for years in peace and content. Together, they listen to the many voices of the river, united in the sacred sound: "Om." Meanwhile, Kamala, unbeknownst to Siddhartha, has given birth to his son. When she and her son go on a pilgrimage to see the dying Buddha, Kamala is bitten by a snake near the river. Vasudeva finds her and brings her to the hut he shares with Siddhartha. Before she dies, she tells Siddhartha that the boy is his son. Siddhartha takes care of the spoiled child and tries to instill appreciation of the simple life into him. He fails, and the son runs away, back to the town. Siddhartha, worried, searches for him. Vasudeva cautions that a father has to let go, has to let his son experience his own suffering--just like Siddhartha's father once had to let go. This illustrates one of the important themes of the book: knowledge can be taught, but wisdom comes from experience. Now Siddhartha is truly enlightened. Recognizing this, Vasudeva goes off into the woods to die. Siddhartha's friend of his youth, Govinda, comes by the river, still a Buddhist monk and still searching for enlightenment. When he asks about the teachings that have brought Siddhartha peace, Siddhartha replies that too much searching can preclude finding, that time is an illusion, that all things are one, and that love for all things is the most important thing in the world. Then Siddhartha asks his still skeptical friend to kiss him on the forehead. After complying, Govinda no longer sees his friend Siddhartha, but rather a sea of people, animals, plants, and other objects of the world. Thus, Govinda discovers the oneness of the universe, just as Gotama, Vasudeva, and Siddhartha had before him. Govinda realizes the perfect truth of Siddhartha's wisdom, and, weeping with wonder, bows down before him. He is the novel's protagonist. Although written in the third person, the novel follows Siddhartha along his spiritual progress. Siddhartha's goal throughout the novel is to reach enlightenment. After attempting many different approaches, he at last finds enlightenment by listening to a river's murmurring and through the ferryman. Govinda is Siddhartha's best friend and companion. He knows that Siddhartha has great potential and will follow him anywhere. It is not until Govinda realizes that he must find enlightenment in his own way that he stops following Siddhartha and instead follows Gotama, the historical Buddha. Siddhartha starts as a rebel through silent disobedience. His father yields. It shows the atmosphere is not inimical to change but is not ripe enough to initiate change, i.e. the physical is not rigid. At this point, there was a choice open to Siddhartha who declined it, whereas his father had reluctantly exercised in the non-negative direction. The choice was between submission and defiance. His defiance arose from a mental conviction for which his other parts were not ready. The rule of evolution is not to exclude what you have exceeded which eliminates totality. Suppose Siddhartha submitted to his father and the father put him through the ritual, his father would have outgrown the ritual in the measure his own readiness permitted.The father gave him permission to leave the house. Siddhartha was haunted by the father in him when his son deserted him. Had he submitted himself to his father, at least, he would have fully outgrown his father then, instead of later, after 20 or 30 years. Had Siddhartha submitted to his father, not with an ignorant physical submission but with the knowledge that doctrines were of no value and his own conviction was not ripe to be acted upon, whatever he had realised in 40 years would have been abridged into four years and his own realisation would have been greater. As his own father had to yield to Siddhartha, he had to give way to his son. Among the Samanas, he learnt austerities which according to Mother are meant for the child soul. From there he landed in life with Kamala, to exhaust the life of desires. Desires can be lived and exhausted or given up as austerities. The desires of the vital and physical can be overcome by mental understanding. Siddhartha chose the second one.When Siddhartha was finally detached form his son, it was worked out in his mind's consciousness. Neither he nor his son was transformed. There was no question of transformation in those days. The Illustrious One, is the Buddha, the founder of Buddhism. He has attained enlightenment, as his peaceful demeanor and gentle, half-mocking smile show, and Siddhartha admires him deeply. But Siddhartha does not believe that it is possible to attain enlightenment through teachers, doctrines, or disciplines, so he leaves Gotama and goes on his way. Govinda, however, becomes one of Gotama's followers, a monk. The beautiful courtesan from whom Siddhartha attempts to learn the pleasures of life. He comes to her filthy and poor, and she helps him to become a man of wealth, clothing, and earthly pleasures. After realizing that he has become an ordinary man, just like the others in the town, he leaves Kamala to again search for salvation. She bears his son. While on a pilgrimage to Gotama's deathbed, she is bitten by a snake and dies in Siddhartha's arms. Kamala represented his desires, but she also represented his detachment. That helped him to give up twenty years later. But the physical is more truly real. She conceives and the final discipline for Siddhartha came from the physical through his son. A rich, conventional merchant. When Siddhartha offers himself to earthly desires, Kamala tells him to make money and become rich by becoming an associate of Kamaswami. Under the apprenticeship of Kamaswami, Siddhartha soon becomes a very rich man. Siddhartha is contemptuous of Kamaswami for lacking compassion and self-discipline, for living only for wealth and property. Over time, however, Siddhartha becomes almost a replica of Kamaswami and his vices. A ferryman who has attained enlightenment by listening the river. Like Gotama Buddha, he is a deeply peaceful and happy man. Siddhartha first encounters him when he needs to cross the river, but has no money to pay for transport. Vasudeva transports him for free, saying that "everything comes back". After Siddhartha leaves the town, leaving Kamala and Kamaswami, he again meets Vasudeva, attains enlightenment the same way, and becomes a ferryman too. Vasudeva goes into the woods and dies in the last chapter but one of the novel. Vasudeva listening to the river is seeing the Becoming as Force and absorbing its wisdom in the subtle plane. Also named Siddhartha, is the son of Siddhartha and Kamala. Siddhartha doesn't know of the son until he meets Kamala on her Buddhist pilgrimage. After Kamala dies, little Siddhartha refuses to obey his father and eventually steals the ferryman's money and runs back to the town. The major theme in the novel is enlightenment. From the start of Siddhartha's journey, he seeks salvation. He joins the ascetics, visits Gotama, embraces his earthly desires, and finally communes with nature, all in an attempt to attain Nirvana. The novel also shows how the path to enlightenment cannot be conferred to another person because it is different for everyone and will likely never be achieved simply by listening to or obeying an enlightened one. For words and teachings may describe the truth but are not the Truth itself; being concepts, they trap you, since enlightenment means release from concepts. Siddhartha knows that he will not attain enlightenment by following Gotama. After waking up by the river, why does Siddhartha say, "Nothing is mine, I know nothing, I possess nothing, I have learned nothing"? Siddhartha awakens from his sleep in the forest and contemplates the lives he has lived. He comes to the conclusion that every approach he has taken at life has lead him to a dead end. Siddhartha's mental quote presents us with two meanings; one meaning was far beneath the surface. His quote refers to his past experiences to explain the questionable reality man still ponders. At this point in Siddhartha's journey, he has been three people: a Brahmin, a samana, and a Buddhist. As he looks back on his experiences, he notes one significant conclusion about each. First, Siddhartha's father passes down wisdom to him, but it leaves Siddhartha with the "nothing is mine" mentality. Siddhartha aspires to gain his own "a posteriori" knowledge and not just trust the "a priori" knowledge of from his father. The knowledge he has before he leaves his home town is not his, it belongs to the community elders he debated with and his father. Siddhartha joins the samanas as a way to gain his own knowledge. However, after living with the samanas, he comes to the deduction, "I know nothing." When he becomes a Buddhist, he renounces all of his possessions. Eventually, he comes to realize that the path to enlightenment may not constitute ridding himself of all belongings. He decides to try the opposite teachings of Buddhism and accumulate wealth and possessions. Not until he runs away from these possessions does he become conscious of what he has learned through his experiences. After Govinda leaves him alone at the river, it occurs to Siddhartha that he is back to square one which explains his thought, "I have learned nothing". He has not attained any of the knowledge he has set out for. Buddha believed that humans are a part of nature. If man is a part of nature, then nothing tangible can truly be his. Can man truly own something? For example, land cannot belong to man since man belongs to the land. This can also be related to Siddhartha saying, "I possess nothing" because material things cannot be a part of us forever. Buddha stated that suffering comes from the material things we possess or think we possess. Siddhartha is saying that we must realize that we cannot possess anything, the illusion of believing we possess only sickens us. Siddhartha left his Brahmin life because he knew only "a priori" knowledge. Siddhartha says that he knows nothing, but can he truly "know" anything. Descartes coincided with Siddhartha's quest for an absolute truth to base his knowledge on ("Cogito Ergo Sum" -Descartes). Instead of embracing the traditional thought of his father and community, he rebels against it. When Siddhartha's path leads him to live with Vasudeva, the dissipation of the distractions of everyday life enables him to achieve enlightenment. However, a paradox is formed in Hesse's Siddartha. Scholars acquire intangible knowledge and learn to memorize information from books (religious) in order to find oneself and become enlightened. Only then is that knowledge regurgitated in their life and work. In turn, this work leads to wealth. If wealth corrupts, where is the incentive to find oneself and become enlightened? Written by a Nobel Prize winner, this is his own mental realisation of the Buddhist doctrine of Nirvana to which they give the analogy of the ever-living river and flame. The mental comprehension can be severely mental and therefore a concept. It can ripen into a comprehension of consciousness, which is a non-existing phenomenon but can be intelligible to mental people. It is not comprehension. It is really to be conscious, rather mentally conscious. It can be of the surface consciousness or the depth of the surface. What Level 1 does is concept formation, pure speculative thinking detaching itself from the sentiment of Level 2 and the organisation of thought of Level 3. Below the depth of consciousness lies the substance of the mental plane in the brain. When it touches its own depth, the centre of action moves from that of the brain to the substance of the body whose original substance is inconscience. Its surface is the subconscient and depth is inconscient. 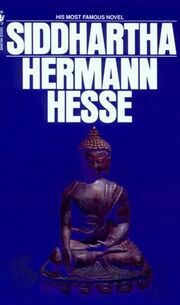 Siddhartha or Hermann Hesse realised the doctrine of Nirvana of Buddha in the surface consciousness of his mind and put it in the form of a spiritual autobiography. Such a realisation has its limits, as it is mental, though the limits of mind are exhausted. It cannot move further to the vital, never to the physical. That is why Buddha's followers started worshipping his idol, an idea he was against. It is said Buddhism took root in the population only when this worship began. This book has a picture of Buddha's statue on its cover. The central idea of this narrative is instructive to me in that Man, Western man, cannot accept the Truth even from the Buddha. He must discover it for himself. That is the mental stage of the West in its progress. Here is a simple fact or a simply folly. It is the ego of the mind refusing to learn form others, scarcely seeing a wider truth behind that when the ego thus realises itself, it will be an egoistic realisation, not a spiritual one. Sri Aurobindo says all yogic realisations until now have been realisations of the surface mind and egoistic realisations. A pickpocket realising his profession is not very laudable, but continuing it in spite of that realisation, is the pickpocket's realisation. His giving up the profession is human realisation. Mind begins with comprehension and when it moves to the negative side it becomes mean, perverse, evil and depraved. When the mind seeks negative fulfillment, it is mean, etc. Siddhartha is one who cannot accept any teaching from anyone, even from the Perfect One. The Perfect One warns him against cleverness. Is there an alternative to this perversity? If the Indian says it is against all his basic faith to accept technology developed elsewhere and what he has not developed he will not accept, it is a laudable attitude. But that way, humanity will remain where it is. No education is possible. As we are all humble before the wisdom of the ages in accepting education, Siddhartha could have accepted the teachings of the Perfect One and discovered it originally for himself, when it would have resulted in the same mental realisation in a short time, instead of a lifetime. Govinda followed the words, Siddhartha the Spirit, through an arduous route. Had he put forward the attitude of humility - the comprehension of the Infinite - not only would he have learnt it quickly, but he could have overcome mind to go beyond. Sri Aurobindo describes the fourth dimension, the Being of the Becoming, where life reveals itself as a Marvel in the plane of simultaneous Time. Siddhartha's revelation that in every truth the opposite is equally true is a supramental perception. It is Hesse's perception. Vasudeva had traveled to the bounds of Time. Sri Aurobindo describes the dimension in which time and Timelessness meet in simultaneous Time. For one who takes to Sri Aurobindo's Integral Yoga, what Siddhartha attained in a lifetime is available at once if the door is not closed, as it was on Siddhartha. It is ego that closes the door. The importance of CHOICE can best be seen in Hesse rather than in Siddhartha or Govinda. The choice existed when Siddhartha left home, joined Kamala, took service under Kamasami, left the world, joined Vasudeva, and went in search of his son. The choice is ubiquitous. Purposeless makes for immortality. This was known to the Rishis, and practiced by Shakespeare in poetry. Sri Aurobindo takes it to life and, that too, everyday life. Hesse comes close to the truth that when progress stops decay sets in, but does not enter into it in any sense appreciable.